Has the grueling summer heat taken a toll on your yard this year? Is your lawn stressed or have weeds, insects, or disease? Or, is your lawn just getting by, but not the best yard in your neighborhood? BestYard.com has produced “7 Secrets to a Beautiful Yard this Fall”. This guide will tell you “how and when” to help your lawn recover from the summer stress, create a beautiful lawn this fall, prepare it to survive our harsh winter, and thrive next spring. 1. 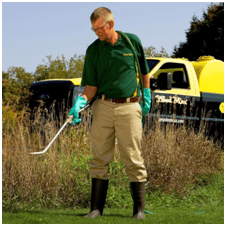 Get Rid of Unsightly Weeds in August & September. Weeds compete with grass for water, space, light and nutrients. They are very aggressive and can easily take over a lawn if not kept in check. Protect your investment with a customized weed control program that will help eliminate unsightly broadleaf weeds. 2. Apply an Early Fall Fertilizer between September 15 and October 31st. Use a 65% slow release granular fertilizer that feeds your lawn over 6 – 8 weeks vs. cheaper liquid or Big Box store granular fertilizer that quickly releases the nitrogen over 7 – 10 days. This will avoid burning your lawn during the last of summer making stress conditions worse. 3. Get to the Root of the Problem. 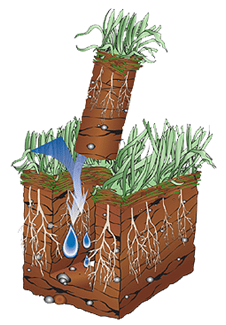 Aerate Your Lawn in September. The stressful combination of hot, dry weather and a season full of foot traffic leaves your soil compacted and making it difficult to breathe. To alleviate this problem CSU professors recommend fall aeration to open pockets of air to allow your turf’s root system to breathe, grow deeper, and absorb nutrients and water. 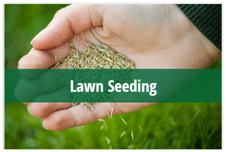 Over seeding is often done with aeration. 4. Over Seed to Improve Turf Density in September. Fall over seeding helps your turf to become thicker and choke out weeds that grew during the grueling summer. The new growth will fill in areas where the grass is thinning or where there are bare spots. The best time to over seed is with aeration because much of the seed will go into the plug holes from aeration. 5. Apply an Early Winter Fertilizer between October 15th and November 30th. Because your lawn is recovering from a grueling summer it is more vulnerable to winter damage. 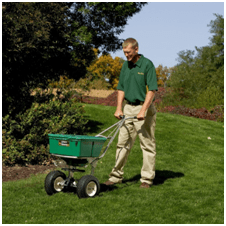 Most of lawn care experts agree that the early winter application of fertilizer is the most important one for lawns. It promotes a healthy, thriving root system, store vital nutrients for the winter and early spring, and aids the cold hardiness of your turf from winter damage. 6. Apply a Mite Control Application in November to Mid-December. Do this if your lawn or your neighborhood had mite damage in 2017. This is one area where an ounce of prevention is worth more than a pound of cure. Mites can cause considerable damage to your lawn if left undiagnosed and not treated in 3 weeks or less. Almost all serious injury by grass mites are related to winter drought stress. South-facing hills with sun exposure are typical areas where turf damage can be expected. 7. Do a Fall Clean Up in November to mid-December. OF COURSE we would love to care for your yard. BUT, whether we provide for your yard or not, we want it to be the best it can be. THEREFORE, we want to provide you the best professional advice for your lawn care in this guide. If you have some items on your “to-do” list and want to move some to someone else’s “to-do” list call 720-851-7550 or click Do It For Me to discuss your lawn care needs or request your FREE lawn care quote.